Tammie Rubin takes ordinary objects and combines them in new and exciting ways, creating intimate ceramic pieces that defy consumer culture. 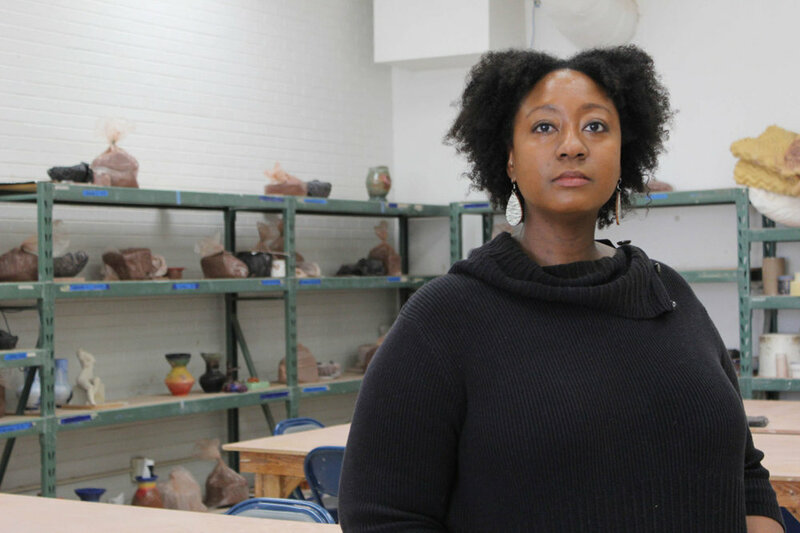 In her fall 2016 exhibit, Before I Knew You, I Missed You, she broke new ground by using the shape of the cone as a launchpad to explore the history of African-American migration and the story of her parents' lives. We spoke with her after the exhibit to discuss the inspiration behind her new work, the meaning and uses of the cone through time, and how the exhibit took shape amidst the frightening rebirth of open white nationalism in the U.S. I was blown away by your exhibit at the de stijl gallery last fall, Before I Knew You, I Missed You. Although I’d seen pictures, I wasn’t prepared for the visceral reaction I would experience seeing your sculptures in person. How did the idea for the exhibit come to you? TR: The work in the gallery is both new and old in some ways. The forms are forms that I’ve been working with for a long time—the conical form. But this idea of travelling, as a contemporary person who has moved a couple places in my life… This is the first time I’ve actually moved south. My parents are both from southern states: my mom’s from Mississippi, my dad’s from Tennessee. He was actually born in Byhalia, Mississippi, but he grew up in Memphis. And my mom is from a small town, Summit. This idea of their moving north was something that they talked about as shaping them as adults; then making these kinds of pilgrimages back to family, things like that. Then grandparents or uncles pass away, and you make fewer trips. Once I moved to Austin was the first time I thought about it—that I’m doing a kind of opposite migration. I’m moving south, closer to where they grew up. But that must have been in the back of my mind the whole time. Obviously the passage of time—my experience is not their experience—but the things that moved them from south to north are some of the things that inspired me. That kind of migration, those experiences, so many people leaving made it possible for me to move back, because it changed the state of labor and housing, and all these other things. So now, as a person of 2017, I can move south with few reservations. At least to Austin, Texas. TR: Yeah, exactly. [laughing] At least to Austin. Did the idea for the maps on the sculptures come to you first, or did the shapes? Was there one that came before the other? TR: Well, like I said, it’s a shape I’ve been working with, so it’s always been there. But I was thinking of this idea of the maps—the actual journey, the physicality of journey. Then this was the first time I’ve used actual figuration in my work, imagery of actual objects—of my parents, of collard greens, things like that. So it felt right to pare down my other works—they’re these kind of clone assemblages. There are many different references that are being brought together, basically being built and unbuilt, and deconstructed and constructed. Here it felt like, if I’m going to have all this information, I actually need a quieter form, in a way. So it’s even more like a simplified form. TR: Yeah, a recognizable referent. But in some ways it’s more one-to-one—a kind of authenticity of like, this is what it comes out of, out of the mold. And then the surface of the clay being a canvas—this carving through, painting on, and chipping away of the mapping information. I think what you’re talking about is that feeling of seeing these forms that are not necessarily intimidating in size, but it’s when they’re put together in a group that they have the idea of physicality. There seems to be something. They have a power as a group, which was important to me. Individually, they may be interesting objects, but it’s when you bring them together that there’s almost something intimidating about them. And of course there’s the obvious reference to KKK hoods, which I think even individually would be difficult, but especially in a group. It’s menacing. But in hearing you talk about it, I was surprised by the clinical approach you took to it, describing the different uses of the cone throughout history, and the different connotations. I wonder what it would have been like to experience this exhibit even a year earlier. Although racism has always been a part of the fabric of American life, the overt embrace of white supremacism by our current political leaders is terrifying, and I was wondering if that was something that had played into the development of this work. TR: This work happened before and during the election. There was the newness of not doing coded language anymore, not doing dog whistle language; overtly being racist was new. They were taking the mask off. So with that, along with the protests that had been happening that had been highlighting the disparity and policing in black communities—all these things have been happening, and I can’t say that they didn’t find their way into the studio. But I wouldn’t say it was a one-to-one relationship. I didn’t make this work based on that, but I’m a human being and take in all this information, and it did seem, as I was thinking of this, you still hear about swastikas, and black churches still being burned to the ground, Dylann Roof… These things never go away. They’re these long-lasting, hate-filled attitudes. Also, symbols, iconography doesn’t go away. I don’t know if they will ever go away. I think in part it’s because we’ve never had a truth and reconciliation. We’ve never really confronted the history of this country—we just keep pushing it and pushing it and pushing it back, and of course it rears up, because we’ve never dealt with it in an honest way. And that would be terrifying to us, right? For everyone. So that’s definitely in the background. Because of the way things are now, the context for the work has probably become more menacing and terrifying. At the same time, the title of the work, Always & Forever (forever ever ever), speaks to American society's enduring racism. Am I reading too much into that, or is there a different meaning behind that? TR: Like I said, the symbols that I seem to utilize over and over are things that we seem to see in our domestic life all the time. Now when I put them upside-down and put eye-holes in them, of course the KKK is going to come up immediately. But the idea of the funnels and the cones didn’t come directly from a KKK mask—they came from domestic objects. There is something about those particular objects that is etched into our psyche, and I really do believe that they have their own innate power, that you understand them when you see them, and they work on multiple frameworks. If I change this one little thing, it’s now this. If I change this other thing, it’s now that. I started using the funnel form, and then I started seeing it other places. I hadn’t realized if I had seen it because it was in the back of my head, or if I recognized it because I had started using it. Like in Hieronymus Bosch paintings, the character that is usually the fool, or the person who is conning, the quack doctor, is always wearing a cone; or in The Wizard of Oz, the Tin Man [is]. The association it has with losing your mind, surreal-ness, the Other, and also stupidity—think about the dunce cap. But also penance, because it was a sort of cap that was worn by a certain brotherhood. I saw that people were wearing these caps in Spain called capirotes; if you were being tried, they would have you wear this hat as a way of humiliating you. That somehow morphed into people wearing these pointed hats when they were doing penance for festivals as they walked through the streets, to show their sense of humility. And then there are brotherhoods such as the Nazarenos that still wear these conical hats in Spain and in Brazil. And we know that the shaman—whatever that shaman is, a bishop, the Pope, or a tribal leader—the headdresses are something that is indicative of anyone showing themselves as part of a pageantry, or the bringer of truth; making yourself bigger, more important. Power. So it’s not an accident that a group like the KKK would do the same thing. Right! I thought, this is so beautiful, but I don’t think I could look at it every day. It’s so uncomfortable, but that’s why it succeeds so well. TR: Of course. If a bunch of people are doing something, it’s hard to stay on the outside and not be with those people. I saw a great photograph on Twitter of a bunch of people during World War II doing the Nazi salute—it’s hundreds of people—and there’s this one guy with his arms folded. Could you be that one guy? I don’t know. When you’re around that many people in a public place, you hope that you would. But it is something that is really seductive—this idea of inclusion and power, and being able to say that I’m better, or I have something that’s different than this other person has. But also, like I said, they’re not just that one thing—it’s another way of thinking of mapping history, and also my personal family’s history, which is not unique to African-Americans who were part of that migration. Yeah, the sculptures were decorated with these migration maps showing the roots of African-American families migrating from the South to the North. And your own family’s route, that was included on one of the pieces as well? TR: They are. If you look at the city of New Orleans’ train line, it goes straight north from New Orleans. It stops in Jackson, Mississippi, which is where my mom would have caught the train, and it stops in Memphis as well, which is where my dad would have caught the train. And then if you go straight north, the stops include Chicago. It was interesting to me to see that where people ended up was directly related to transportation and direct routes. If you were taking the train from Texas, for instance, then most likely you would have actually gone to California, because that’s where the train system would have gone—you would have been in LA or Oakland. Some would have gone to North Michigan. But if you were in Florida, then you’re going to end up in DC or New York, because that’s where the transport is taking you. Even with driving—even after 1964, which was supposed to be the end of segregation— you couldn’t just drive anywhere and think that you could get a hotel. You would really have to route it out: How far can I drive until I know that there’s a place that I can stay? And that would determine your route, and that might determine where you end up living. So, looking at these maps—this is why I grew up in Chicago, because that was the train route. My parents didn’t get on the train to go to Detroit. This is why we live here. So, that was fascinating as well. Were there any other patterns or designs or inspirations that you used to decorate the sculptures? TR: Some are train systems, specifically the Illinois Central train. Some are mappings from where African-Americans lived—predominately rural areas. Others were migration of percentages, how the numbers would decrease in one area and increase in another area. Some were just the interstate highways—I forget what year it is, but when we decided that all the interstates were going to be mapped and have specific numbers that everyone would follow, that was huge. TR: I want to say that was in the ’50s. All of a sudden you could look at a map and say, “Oh, that’s how I can get there.” As a sculptor, sometimes it’s easier for me, and less expensive, to drive my work to exhibitions. And some of my relatives would ask me if I’m driving, because I’ve driven to Baltimore or Seattle, for example, by myself. And they’re always like, “I can’t believe you’re driving like that. Is someone going with you?” I always thought that that was a gendered question—and it is, in some ways—but then I also realized that these relatives think it’s kind of amazing that you can do that and you’re not afraid to do it. I don’t have a fear that I won’t be able to pull over and find a hotel. That’s never occurred to me. And that question, no one explained it, but one day it just occurred to me. It’s not just the fact that I’m female and alone, but also the fact that they can’t imagine, in their youth, being able to do that. The fact that I can just pull out my phone and Yelp a hotel in my area is pretty amazing. Your work often grapples with the tension between ready-made household objects and more intimate handcrafted items. We saw that in this exhibit with the beakers. Can you tell us a little bit about them, and how they fit into the exhibit? TR: Sure. I had gotten this lab equipment from a surplus, and, like many artists, I just collect materials. So I had been literally rolling around with those beakers for years. I was thinking about viruses and how diseases that we’ve worked so very hard to cure are making their way back, because of this kind of anti-intellectualism and this feeling of security. And at the same time, watching Ebola ravage a couple countries in Africa. And then here people are like, “I don’t need to vaccinate my kids.” I had a friend who teaches in grade school, and that was a conversation they would have—the whooping cough is back. I remember when I was a kid, I got scarlet fever, and my mom was freaked out. So I just think that we are so blessed to have researchers out there doing this work, and our lives can be transformed. I did not grow up in a generation knowing a couple of classmates that were in an iron lung. If you were to ask a generation or two generations before, they would tell you that they knew someone. In any case, that work did not come about, because as I became more interested in the work that I was doing with cones, it shifted into the beakers becoming another way of thinking that this is all an experiment—the American democracy is an experiment. We’re such a young country—we’re still forming, we still don’t know what we’re going to become. Maybe the democracy that we’ve had up until this point is just a short-period of time, and that’s over, and it will become something else. It’s not going to stay the same. So thinking about this particular period of time—from 1910 until now—is also an experiment that we’re still feeling the ramifications from. And so the idea was to etch onto the glass. But there aren't maps on the beakers. TR: No, they’re not maps. They’re more of a visual story, or a visual telling of my parents’ migration. And they’re put into conjunction with specific historical time events—basically, the Civil Rights Acts. My parents were married in 1965. My dad was born in ’32; my mom was born in ’38. My dad gets to Chicago in ’57; my mom in ’59. So I knew, of course, that the Civil Rights Act was in 1964, a year before they were married. What I never thought about was that after they moved from their towns north, when they visited their families, they were actually going back to a segregated place. If they were taking the train back, at the tip of Cairo, Illinois, and if you were going south, you would then have to move into a segregated train. If they were going north, they could then move into any train. So the fact that you leave, but if you visit your family, you still have to go through this tucking yourself away, making yourself smaller, being concerned about your safety, going back to segregation. And that part I never really thought about. That started these etchings where there are pictures of my dad, when he came. The year he came was when he was out of the Army—the Korean conflict. So his picture is an Army picture. Then my mom’s is the year she graduated from high school; half of her class were all coming north somewhere. And then another picture of them is from the year that they got married. And then there are beakers from 1964, with the Civil Rights Act. The Voting Rights Act was 1965, and then the Fair Housing Act was 1968. All of those things affected them profusely, and we still feel the ramifications of those in Chicago. It was so segregated, because you could not live wherever you wanted to live, even though you were up north. This idea that it was going to be some open, promised land was a complete and total myth. Some things were better, some things were worse. Also, I was thinking that it was not all negative—there was something lost from them moving. When we would visit, it was like a sigh, like they were home. When we would visit relatives, they loved the food, the climate—all of those were things they would have wanted to keep, especially the close relationships, especially in the town where my mom lived. I feel like, on that side of town, where black people lived, we were probably related to half of those people. [laughing] Before you even got into town, there would be someone saying, “You’re such and such’s grandkid,” and you’d never even met them before. There was a sense of community and openness. And there were things that my parents brought with them—food, for example, which is not unique. My dad loved boiled peanuts, which I find is a Southern thing in some ways. Hominy, and collard greens, and other foods. All of these references are brought in. And it’s not important to me that you didn’t realize it, that you get all of those things—it’s not an ABC. But there are these fleeting references, almost like the corner of your eye, that are there. It’s almost hard to see, on the glass, because you have to really get close to it. If the light is shining in a certain way, the best way to see it is in the shadow on the pedestal, on the shelf, because there’s a reflection that happens there. So it’s these two representations of these visuals that are kind of hard to see, kind of fuzzy, not tangible, is the way I was thinking—these experiences and memories that are not quite tangible. I never would have thought of that layer of engagement. Can you tell me about the title, Before I Knew You, I Missed You? It’s like a love story. It’s romantic. TR: Exactly, and there’s losses on both ends. What I found fascinating is that the African-American experience of migration is an immigrant experience, except they’re not immigrants. They’re migrating within their own country, but some of the stories are exactly the same as what people say when they came over. When my mom moved, she lived with a relative. So you rented a space from a relative, you sent money home, you tried to make pilgrimages home, you tried to make sure that your kids had some kind of relationship with where you came from. Those are some of the things we like to talk about as the fabric of the immigrant experience here, but it’s the same. Much of your work has an air of whimsy, and I think this exhibit did as well, which I think contributed a lot to its power and menace in a surprising way. Can you tell me about your process for creating forms, in this exhibit and in general? TR: When you say “process,” are we talking technical or conceptual? TR: Well, because of the materials that I’m engaged in, because I’m a studio artist, the materiality is essential to me. And with that comes a certain amount of learning techniques and skills, and many steps to get to the end work. The idea behind taking things that already exist, oftentimes these things being throwaway items made out of plastic, things that don’t have great value, and then transforming them into porcelain, which at some point in history was “white gold,” there’s an absurdity to that—taking something that’s throwaway and turning it into a precious object. Do you make a mold first? TR: I make multiple molds, and sometimes I find molds as well. That mold then becomes the negative, and that negative is filled with a positive, which is the casting slip. Then that becomes the positive that I pull out, which is a shell. It’s really kind of thin. Then I use that form to carve through and attach other forms to—construct, deconstruct. The idea of layering of surfaces has always been important to me, because there’s a tactility to the pieces. It’s about this idea of the senses—wanting to touch, wanting to lick. Our senses make us who we are, our senses being heightened. Clay is a material that allows me to do that in the most straightforward way. And it’s also a material that keeps me somewhat humble, because it has to go through all of these steps before I get to the end, and I can’t control it all. There may be ways that things bend, drift, or shift that I don’t get to control. And I like that. Is it a surprise, then, when it’s finished? TR: Well, it’s not necessarily a surprise, but there’s always an element that I don’t quite control. I know what they’ll look like. I do a lot of testing. It would be disingenuous to say that after working this long with the material that I don’t know what it looks like. [laughing] But I will say that if one cone is more than a fourth [inch] thick, and then it shrinks, it may shrink in a way that one side pushes out farther than the other; the wall might have a slight shift. That is something that I can’t control. It’s these little things that happen. And sometimes you lose work. Sometimes it just doesn’t work out. But you keep working through that to come out on the other side. What about some of your older exhibits, where you had what looked like balloon animals and more ambiguous shapes. How would you create them? Would you take different molds and combine them? TR: Yeah. Basically, I take parts. Sometimes if I find a mold, there might be one part of that form that I actually like, so I might cast it and then cut it into pieces for one thing. So it really becomes like a collage—a three-dimensional collage, where I’m taking multiple parts and score-and-slipping them together, adhering them with the same clay that’s been made into a little slip, and compressing them so that they fuse together and become one. When I’m working in that way, I don’t know what exactly that form will be, but I am making a decision to pick certain things. Oftentimes I end up casting more than I’m going to use. There’s definitely something very intuitive about it, and it happens through me working in this space—in the studio. When I say I’m a studio artist, I have to be physically in the studio to make work. Not that I’m not doing researching or reading, but I don’t start with an idea first and then go into the studio, or have someone else fabricate it. I have to make it myself, at this point, for the work to be realized. When I was reading your artist statement, I was surprised to see that consumer culture plays such a role in the conception of your work. Can you tell me more about the desire for sensory perception that you were describing, and how you feel that consumer culture engenders that and how your work approaches that? So I was thinking about myself as a new person—I thought, I’m going to be the kind of person that is going to go hiking! I’m going to be involved in nature! When you walk in Seattle, people are wearing Patagonia and North Face. I was working in an office where one of my colleagues was wearing climbing pants. There’s this idea that you want to be out in nature, but I found out that’s not who I am. My forays into nature are very managed. I’m on a trail, you know. I can be out there a couple of nights and then I want to go home. And it was kind of surprising how little I knew about nature—things like names of trees. I felt how ignorant I was. I thought, what’s in my environment is concrete and managed lawns and a lot of goods. That’s what I pass all the time. There’s all this stuff and packaging for the stuff—all of this kind of clutter. You go and buy something and you realize the thing that you wanted is so small, but the packaging to get to that thing is so much. That’s fascinating, because it reminds me of how you were saying that when you’re making a mold, there will be just one part of an object that you want. It’s just like the packaging. But it’s beautiful, intimate stuff! The idea of the funnels and the cones didn’t come directly from a KKK mask—they came from domestic objects. There is something about those particular objects that is etched into our psyche, and I really do believe that they have their own innate power, that you understand them when you see them, and they work on multiple frameworks. TR: So these things were going through my mind. I was working at this school, and they had a thing that whenever we had a meeting, they had to order food—no matter how short the meeting. We were grateful, but it seemed dumb. They had to order catering and to feed you. So you would go to the break room and see how many meetings there were, because all this catering plastic would just be stacked up. Our break room literally faced the Sound. So I’m looking at these recycling bins overflowing with plastic, and I’m also looking at the Sound—at the ocean out there. These two things don’t meet up. That plastic was one-time use. So I started collecting it, and that led me to start collecting the packaging from normal trips I’d make to the store for things. Then I started to make molds of those things, and kind of looking at the things in my collection of things I would collect as an artist, I noticed that there were always these recreations of nature—it’s not a realistic duck, it’s a rubber duck, for example. It’s not a real tree, but a fake tree. And the new nature for me—the urban—would be the fakeness of these consumer goods, transforming those into these sculpture assemblages. So that’s how that started. It’s expanded and changed and shifted from there, but that was the original post-graduate shift in work. Before that, in graduate school, I was a figurative artist. TR: Yep. It’s not the same at all. Have you ever let anyone touch your work in an exhibit? You want to, when you look at it, and it’s made to entice that feeling. TR: But it’s also made to deny you that feeling. It’s not interactive. There’s a dissatisfaction there. What does that speak to? TR: I don’t know about you, but I feel that’s the human condition. Even when things are going well, you still feel slightly dissatisfied. Whatever you have, you want a little bit more. You want something else. Ah. That’s consumer culture. You’re bred to always want more, buy more. TR: Yeah, you want more, or another version of it. It’s fascinating to me, as technology moves along. I’m on my fourth or fifth cellphone, maybe even on my sixth. Before I got an iPhone, the only reason I would get a new phone was because a part would break, and then they would say, “We can’t fix it; we don’t have those parts anymore.” They would make you get a new one. I thought, how can something be obsolete? Imagine if your refrigerator were obsolete in two to three years—that would be completely unacceptable. But we’ve all said that this is fine, that something has such a short shelf life. There’s got to be some ramifications that are coming down the line for that. Within your lifetime, how many of these things are you going to be discarding? The fact that I can’t necessarily get things fixed anymore… You used to be able to take your tube television in and there would be a guy that could fix it. I took a lamp in, and he said, “There’s no way for me to get inside to fix it.” Or I called for a part for a phone, and they told me, “Ma’am you’re just going to have to get a new phone.” I remember being so outraged, because it’s just this one little antenna part. And yet I was being unreasonable. I find that a little bit frustrating. On the other hand, I love my iPhone. Future generations might not even know the concept of repairs. TR: I know. I have a pair of shoes at a cobbler, a shoe-repair store right now. And I always think, when are these things going away? Unless one of their kids is also being trained… as soon as that kid says, “No, I want to do something else,” there will be no shoe-repair places around. What have you been working on since the exhibit? TR: I had a couple of commissions that I was doing. I’m finishing those up, and I’m working on a piece for a show that’s going to happen in Portland [Oregon] in the spring. It’s a group show, it’s part of the NCECA [National Council on Education for the Ceramic Arts] Conference through Pottery Northwest, which is an arts organization out of Seattle. And I’m thinking about where I’m going to go next with this body of work. I’m hoping to do some interviewing of relatives and collect stories, their stories of moving and what they missed about being home, what they discovered. I’m feeling some regret that I didn’t do this with my parents, but I think I wouldn’t have thought about it before. So talk to your parents and grandparents! Once they’re gone, you really get nostalgic for that information you don’t have access to. Was your parents’ passing a direct inspiration for this exhibit? TR: I don’t think it was right away, but it’s a thing that happens in waves. My dad was in 2008, and my mom four years later. So it was a pretty close period of time. Anyone who has lost their parents… It’s hard to know what to do with yourself. That kind of grief hits you at odd times, in odd ways. You are now the archivist for yourself. You’re never more an adult until your parents pass. So, like I said, this idea of nostalgia of their experience, and wishing you’d had more in-depth conversations, and also thinking about your own experience, whether I am being present in my own life. This is a finite time that we have here. Interview by Sean Redmond. Photography by Sunny Leal. Images of artwork appear courtesy the artist.